When I think of fudge, memories of summers up north in Michigan immediately come to mind. Every year, my family and our friends would rent a place in Harbor Springs where we would play whiffle ball, relax, eat, and inevitably, find our way to Mackinac Island. And Mackinac Island meant one thing–fudge. Even though we left Michigan in 1985, I still have very vivid memories of the multiple fudge shops, with their marble slabs and long spatula/scraper tools. And every time I go back to Detroit for a visit, I hunt down Mackinac fudge to put in my suitcase and bring back to LA. It’s just that good. Until yesterday, I had never made fudge before. I suppose because really, I know nothing will ever come close to Mackinac fudge. But as I was browsing food blogs, a photo caught my eye and I knew I had to give this recipe a go. What could possibly be bad about chocolate and peanut butter? In this case, absolutely nothing! The fudge is good. Not Mackinac good, but good. The recipe was easy, and the only problem I ran into was the chocolate and peanut butter layers separating, making it difficult to cut. But this also gave us the chance to taste the flavors individually, and I have to say, I think the peanut butter part is my favorite. Combine 1 1/2 cups sugar, 6 tablespoons margarine and 1/3 cup evaporated milk in a medium pot. Remove from heat and stir in chocolate pieces until melted. Add 1 cup (1/2 jar) marshmallow creme and 1/2 teaspoon vanilla. Beat until well blended. Repeat with remaining ingredients substituting peanut butter and spread over chocolate. Even with my stomach flu this looks good! I think you need to send that fudge to Texas for quality control evaluation. Uh, yeah, that sounds right. Great Job and BTW – My family loves the peanut butter part best too. And, i’ve had the same separation problem before. It could be a temperature thing. Or…did you use a mixer to blend the marshmallow in. If not, that may be why. Bakerella, I did it by hand. I had no idea it made such a difference, I’ll use a mixer next time! Thanks! 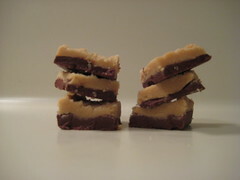 The only fudge I every make is a Brown Sugar Fudge recipe I found in Bon Appetit years ago (I’m sure its on Epicurious). It has a little bit of a different texture than regular fudge…less smooth….but everyone who tries it absolutely devours it. I’ve never been to Mackinac Island, but I hear it is gorgeous. Now that I know about the fudge—I’ll have to make it a destination one of these days! I’ve been to Mackinac Island and, yes, I remember the fudge! Thanks for this recipe post. I’m going to give it a try. Nice post which The fudge is good. Not Mackinac good, but good. The recipe was easy, and the only problem I ran into was the chocolate and peanut butter layers separating, making it difficult to cut. But this also gave us the chance to taste the flavors individually, and I have to say, I think the peanut butter part is my favorite. Thanks a lot for posting this article.